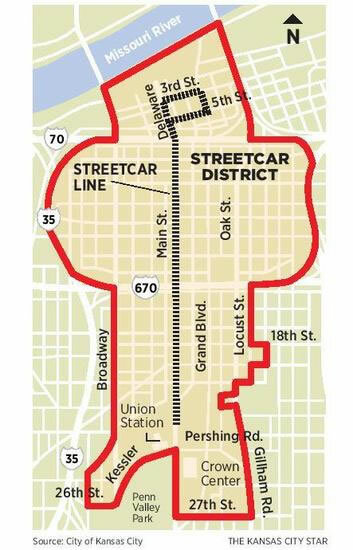 The Kansas City Star reports on evidence that the planned streetcar is inspirinig development along the line even though construction has not yet begun. Developer George Birt is quoted as saying that the street car through River Market will help his 127-unit River Market West aparment project which is currently under construction. Jack and Kim Nguyen are planning to open a Vietnamese Restaurant in the River Market and expect diners to use the streetcar to reach the restaurant for lunch or dinner. A Colorado developer is planning a five-story aparment building on a parcel now occupied by a parking lot. A group of local developers say the streetcar supported their decision to redevelop an old building to house 82 luxury apartments. Other porjects include another tower being converted to apartments, a bar, and a new parking garage. The Downtown Council has produced a map that shows more than $500 million in projects that have been announced since the current round of streetcar planning began in 2010. A Council officer reports two to three calls come each week relating to projects that would be close to the streetcar route. The proposed projects will still include parking, but the streetcar is seen as attractive to prospective tenants, particularly young professionals. City Councilman Jim Glover says the streetcar will spur development of a more walkable, pedestrian friendly environment.